Matthews Beach is a community in Seattle, situated at the southern end of Lake City, about two miles northeast of the University of Washington and about eight miles northeast of downtown. 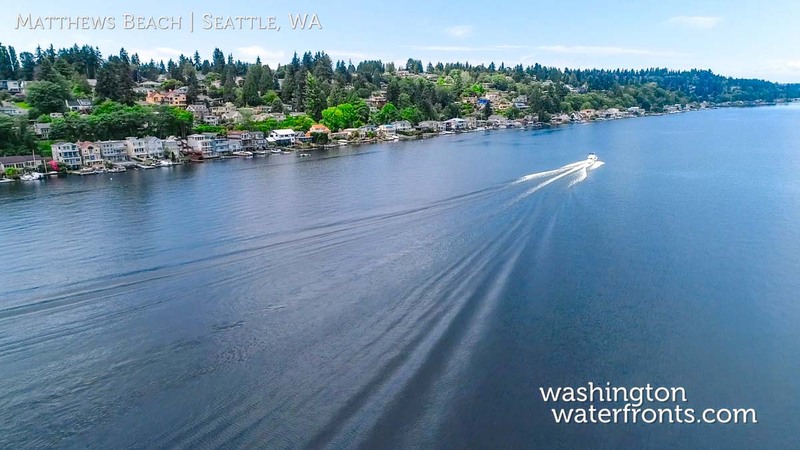 One of the most popular hangouts in North Seattle due to its location on Lake Washington, owning Matthews Beach waterfront real estate offers the chance to truly enjoy the good life, indoors and out with some rather magnificent homes found in this neighborhood. You’ll also have easy access to the largest freshwater bathing beach, the aptly named Matthews Beach in Matthews Beach Park, which also has the popular 27-mile Burke-Gilman Trail running through for walking, jogging and biking. With Matthews Beach waterfront real estate, you’ll have a short commute to many major employers throughout the Puget Sound area, as well as convenient access to all of the city amenities you could ever want or need, from world-class restaurants and shopping to cultural attractions, nightlife and more. Look forward to attending Washington Huskies’ games just minutes away, and just a little further south, the NFL Seahawks and the MLB Mariners. You’ll look forward to waking up and sipping your coffee while gazing out at the lake, often as smooth as glass in the early morning hours, practically untouched, other than the ducks that float by. With Matthews Beach waterfront real estate, you can head right out to the lake, paddle in hand, slipping your kayak or paddle board into the water. Or join the swimmers, boaters, jet skiers, wakeboarders and others in this water playground. Matthews Beach homes are almost entirely single-family homes, including everything from more modest mid-century cottages to lavish waterfront estates. It’s hard to beat the views – some offer them from every room in the house. No matter which one you choose, this is a community you’ll look forward to returning to every time. Take advantage of our industry-leading tools to make your property search as easy as possible and be sure to register for a FREE account so that you can receive email alerts whenever new Matthews Beach real estate for sale hits the market. If you’re seeking to sell your Matthews Beach property, contact our Waterfront Specialists directly for a comprehensive listing analysis and to learn more about the cutting-edge marketing strategies we’ll use to sell your home quickly for top dollar!